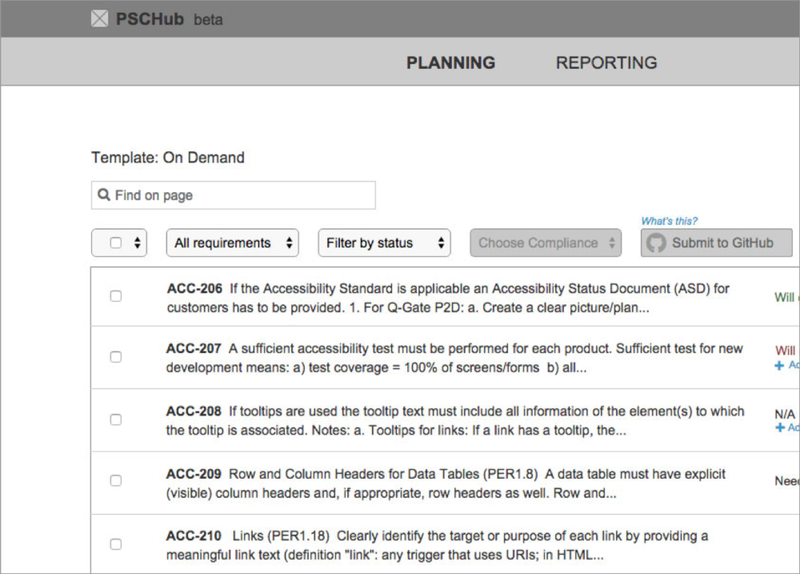 PSCHub was an experimental SaaS application for managing product standards compliance. Product teams within the company had struggled for years with arduous, labor-intensive processes and a legacy tool. 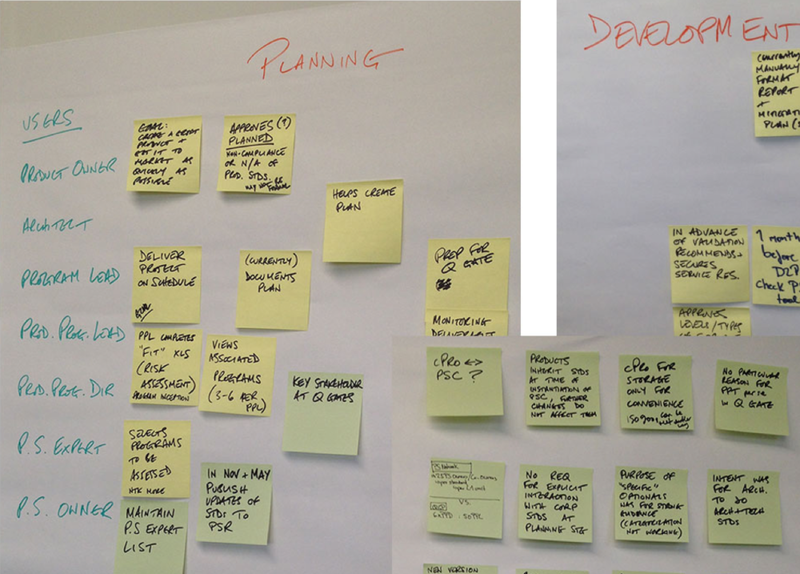 Our goal was to radically re-imagine and simplify product standards management. The need and opportunity to re-imagine product standards management at SAP came from generative research synthesized in a design thinking workshop. SAP practices design thinking extensively, and I moderated a series of workshops to focus our attention on areas of most value to product teams. I created a concept model to understand how PSCHub would fit into a new ecosystem of tools and services that we envisioned to support product development. Based on research, our idea was to create very lightweight tools, powered by a common platform, that teams could add and use quickly and easily as they needed. Because the process was so complex, and we wanted to re-think it so fundamentally, it took many rounds of wireframes, and a lot of user feedback to find a good starting point. One insight early in the research was how important it was to separate planning from reporting. Interestingly, the closer we got to our beta launch it became clear that it was a legacy distinction we could drop. After extensive prototyping, we launched a productive proof of concept, a minimum viable product, to further learn from actual day to day usage. We learned we had a solid starting point, and won many fans very quickly. We also learned refinements and additional features we needed to make the solution even more valuable. From research, we learned that teams fully understood why they needed to manage compliance (security, performance etc.). but they deeply resented how. It was painfully cumbersome and repetitive; it was tough to collaborate and know where in the process you were. I created a low fidelity experience map on a wall of the team room. I used it to synthesize, and communicate what we were learning in our ongoing research. Managing products standards is quite complex, with many stakeholders, and interactions - it was helpful to describe all the activities and timelines that occur. I created an interactive Axure prototype for PSCHub. I don't always find it necessary to create rich prototypes, but in this case it was essential. The prototype helped us test all key functionality before committing to development. It ultimately saved us more time than we invested in it. 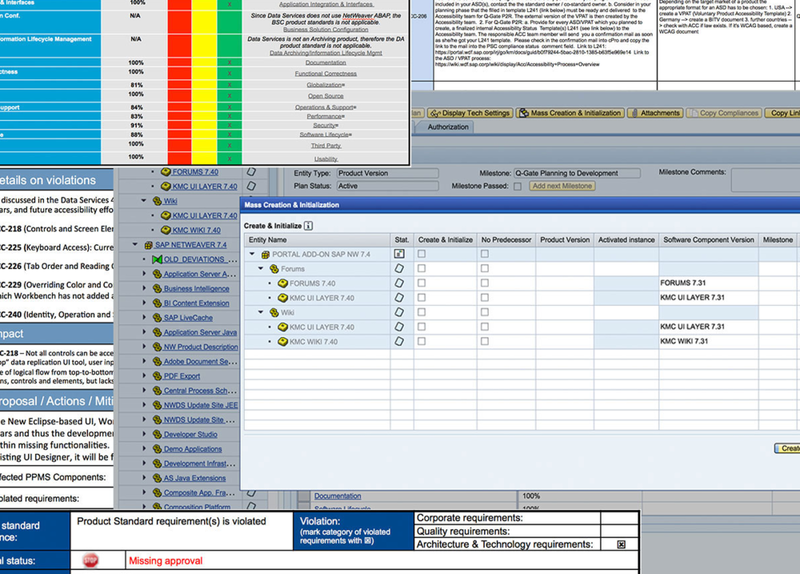 We abandoned the planning and reporting distinction thanks to being able to test a prototype. Since PSCHub was a proof of concept, and our main focus was deeply understanding the problem space, I didn't spend time refining the visual design. It was important for users to be able to quickly understand decisions and actions taken, so statuses are surfaced to the home screen and follow a simple semantic rules.